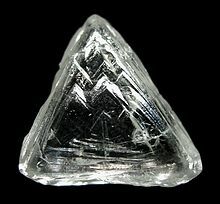 This natural diamond crystal contains flaws and the flawless diamonds called paragons are rare. Aristotle, Confucius, and other classical philosophers propounded the principle of the golden mean which counsels against extremism in general. The Pareto principle or 80–20 rule explains this numerically. For example, it commonly takes 20% of the full time to complete 80% of a task while to complete the last 20% of a task takes 80% of the effort. Achieving absolute perfection may be impossible and so, as increasing effort results in diminishing returns, further activity becomes increasingly inefficient. Robert Watson-Watt, who developed early warning radar in Britain to counter the rapid growth of the Luftwaffe, propounded a "cult of the imperfect", which he stated as "Give them the third best to go on with; the second best comes too late, the best never comes." Economist George Stigler says that "If you never miss a plane, you're spending too much time at the airport." In the field of computer program optimization, Donald Knuth is often quoted: "Premature optimization is the root of all evil"